ion and rebirth, division and unification and, especially, friendship with the United States in modern times. 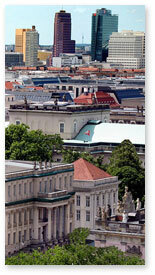 Today, Berlin boasts 3.4 million inhabitants and is Europe’s third most visited capital. Due to its nightlife, festivals, contemporary architecture and avant-garde arts, Berlin has become a center for liberal lifestyle, modern zeitgeist and low-cost, high quality living. And the cuisine of this region is as colorful as the city itself! One of the people who had the greatest influence on Berlin’s cuisine was not, as one might think, a trained chef, but a politician: Frederick the Great. In the early 18th century, this king of Prussia ordered his subjects to eat primarily cucumbers and potatoes. These foods were brought to Europe a few hundred years before from America. Frederick the Great encouraged the consumption of these crops because both were cheap and fit the frugal Prussian lifestyle. To this day, they are still regional favorites in Berlin and feature heavily in Berliner Food. All in all, the traditional Berlin cuisine tends to be rustic and hearty, based on pork, goose, different types of fish, peas, beans and potatoes. Three typical Berliner dishes are Currywurst, Eisbein and Berliner. Currywurst is a grilled pork sausage cut into slices and seasoned with ketchup or tomato paste blended with curry and generous amounts of curry powder. Some use ready-made curry ketchup, which is now also available in the United States. 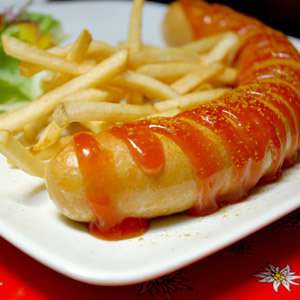 Currywurst is often sold as a take-out food and usually served with French fries (Pommes Frites) or bread rolls. Eisbein mit Sauerkraut (pork knuckle on sauerkraut) is heavily marbled meat covered with a thick layer of crispy fat, or “crackling”. The meat is tender and aromatic, but must be cooked or braised for a long time. Usually it is sold cured and then used in simple, hearty dishes and often paired with Berliner Weisse, a light, fruity beer. The Berliner is a doughnut made from sweet yeast dough fried in fat or oil, with a marmalade or jam filling and usually topped with icing, powdered sugar or conventional sugar. The name is used primarily outside Berlin; the real Berliners call this pastry Pfannkuchen. Along with the popular Spritzkuchen (cream puffs), the Berliner is a popular afternoon snack available at every corner bakery, and a “must eat” on New Year’s Eve and carnival. A common practical joke is to secretly fill Berliners with mustard instead of jam and serve them together with regular ones. Unlike the rest of Germany, Berlin pubs have never had official closing times. So, all day and all night long, pub goers drink their Molle (a glass of beer) together with Rollmops (rolled fillet of marinated herring), Buletten (cold hamburgers without a bun, dipped in hot mustard) and gherkins. The Molle is usually a pilsner beer produced by the traditional Berlin Breweries such as Engelhardt, Schultheiss und Kindl. 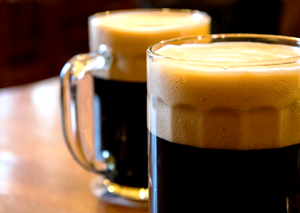 Bockbeers also have a long tradition in Berlin. The Berliner Weisse is a real Berlin specialty, very refreshing in the hot summer months and is served throughout Berlin. It contains only around 2.8% vol of alcohol, is top-fermented, slightly clouded and has a slightly lemony flavor. It is served in a large goblet with a straw and commonly drunk as Weisse mit Schuss, Weisse with a shot of syrup, either raspberry syrup (Berliner Weisse rot), lemon syrup (Berliner Weisse gelb), or woodruff syrup (Berliner Weisse grün). Besides the typical neighborhood pub, Berlin also features numerous beer gardens which are open as soon as the sun comes out. Some beer gardens are beautifully located next to one of the many river embankments in the city. There are also romantic boat restaurants with a special ambiance for a nice summer evening! Over 200,000 of Berlin’s residents are of Turkish origin, either guest workers from Turkey or Germans of Turkish descent. This makes Berlin the largest Turkish community outside of Turkey itself. As a result, Turkish Döners, traditional Turkish restaurants or fast food kiosks serving marinated lamb kebob in flatbreads, salads with yogurt dressing and other Turkish delicatessen, can be found at every street corner. It is estimated, that the 1,300 döner restaurants in Berlin exceed the number of döners in Istanbul! 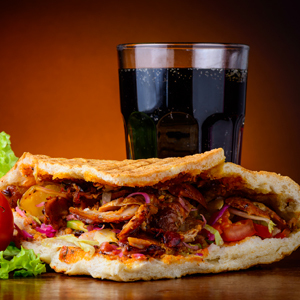 Döner Kebab is a beloved specialty in Berlin, as in all of Germany! The mix of meat is shredded and put in a pita, and served with curry sauce, making it international relations at its best! Another culinary attraction is the sixth floor of the “KaDeWe.” This is an abbreviation for the Kaufhaus des Westens, a large upscale department store in the center of Berlin. This huge department store has almost everything one could want, including food! With more than 34,000 specialty and gourmet foods and beverages, the KaDeWe delicatessen section is one of the largest in Europe and a true “must see,” or “must taste” for every visitor to the city!